Virtualization opens up new ways to architect, deploy and operate wireless networks, and its flexibility allows mobile operators to experiment with new network topologies. Virtualization has a profound impact on mobile networks end to end. As it shifts some of the traditionally centralized core functionality closer to the edge with initiatives like MEC, it also pulls the RAN infrastructure in the opposite direction, away from Distributed RANs in the edge to a shared, centralized location – with the Centralized RAN and Cloud RAN architectures. In a Cloud RAN, the CPRI fronthaul is replaced by a lower-bandwidth functional split, and baseband BBUs can be moved farther from the edge and become virtual BBUs. Through virtualization, the combination of a more distributed core and a more centralized edge in a Cloud RAN creates an intermediate area where processing can be shifted. From a performance perspective, we can expect improved traffic and interference management, more advanced quality of service (QoS), lower latency and more efficient use of network resources. From a financial perspective, operators can save money – and squeeze more value from their wireless networks – when they place processing where it is most effective and least expensive. 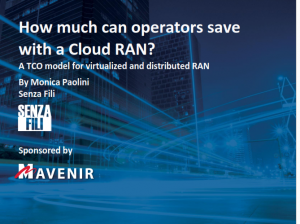 In this paper, we present a TCO model to show the cost savings an operator can expect in a Cloud RAN deployment over 5 years. We drill down into the specific financial benefits that macro cells and indoor and outdoor small cells contribute to the overall network. The specific cost savings vary across markets, operators, and environments (e.g., rural vs metropolitan, dense indoor vs low-density suburban environments), but the drivers are the same. Although our model enables us to look at how variations in cost assumptions and deployment strategy affect the business model, in this paper we direct our attention to a base case model and explore the joint impact that these drivers have in motivating the shift to a Cloud RAN architecture.